Many Igbo feel politically and economically marginalised, and the government’s hardline stance is not helping. 50 years after Nigeria’s then Eastern Region declared itself the Republic of Biafra, sparking a brutal and costly three-year civil war, the country again faces a separatist challenge. 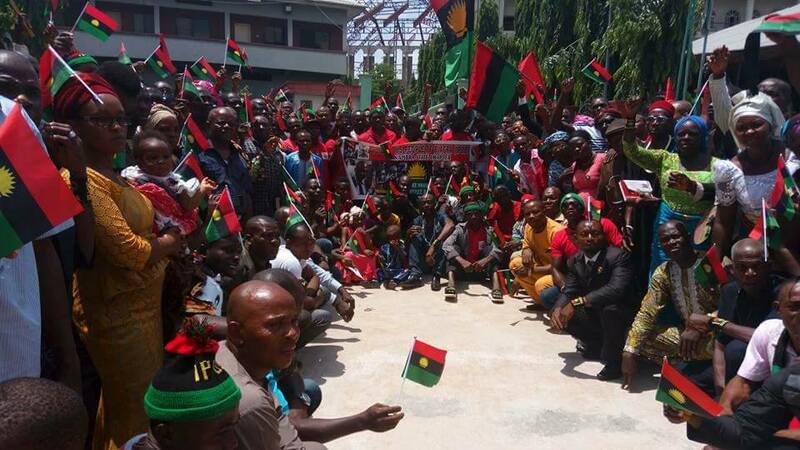 Across the Igbo south east, there is resurgent agitation for an independent Biafra state. President Muhammadu Buhari’s forceful response to the agitation has been counter-productive, inflaming passions and boosting separatist sentiments. The government needs to change course and prioritise dialogue over coercion. The starting point of any response is to understand the agitation’s roots. They include political and economic grievances, a deep sense of collective victimisation among the Igbo, and the failure of south east politicians to provide good governance and development. Separatists contend that since the Biafra War, the Igbo, one of the country’s three major ethnic groups, have been marginalised. They note that no Igbo has been elected to lead the country since Nnamdi Azikiwe’s ceremonial presidency in the 1960s or to be vice president since Alex Ekwueme (1979 to 1983). This persisted even under military rule. The only Igbo head of state in this period, Major General Johnson Aguiyi-Ironsi, was killed after only seven months. Administrative structures decreed by northern-led military governments have also undermined the region. Of the country’s six geo-political zones, all but the south east contain either six or seven states. The south east has just five, while it accounts for only 96 of Nigeria’s 774 local governments. Representation in government and the flow of federal resources are based on these administrative units. Today, the south east, like much of the country, suffers deficient and dilapidated infrastructure and widespread youth unemployment. But many believe this is structural. They point out that as federal revenue allocation is based on number of states and local governments, the south east receives the least of all zones. Under Buhari, political grievances have deepened. With no Igbo heading any of the military and security services, many argue the region has no voice in key organs such as the National Defence Council (NDC). “We are like second class citizens, of the same status as a colonised people, except that this is internal colonialism, caliphate colonialism”, asserted a retired Igbo military officer. The situation has also been aggravated by Buhari’s statement shortly after coming to power that “constituencies that gave me 97% cannot in all honesty be treated, on some issues, with constituencies that gave me 5%”. To many in the south east, who mostly voted for former president Goodluck Jonathan, that statement raised fears that the president would not accord them equal treatment with the north. They now see their fears confirmed by some government actions. For example, when the domestic intelligence agency the Department of State Services recruited recently, it hired just 44 new employees from the south east compared to 165 from the north west. Similarly, the south east is nearly completely excluded from a proposed national railway development plan. Along with political and economic grievances, separatist agitation is driven by a strong feeling of collective victimisation. In 1949, the prominent Igbo leader Nnamdi Azikiwe asserted “it would appear that God has specially created the Ibo people to suffer persecution and be victimised because of their resolute will to live”. Almost 50 years later, another distinguished Igbo, Chinua Achebe, claimed that “Nigerians of all other ethnic groups will probably achieve consensus on no other matter than their common resentment of the Igbo”. These feelings have been deepened over the decades by recurrent rioting in the north in which Igbo have suffered great losses. Mostly notably, over 30,000 Igbo in the north were killed and two million fled back to the south in 1966 in the “Igbo pogrom” that followed the January coup and July counter-coup. During the Biafra War, all other groups rallied round the federal government. The conflict killed about two million people, mostly Igbo, and more died during post-war riots and conflicts in the north. Some northern leaders have argued that the Igbo were targeted because of their entrepreneurial success not their ethnicity, but such explanations offer no consolation. As one Igbo civil society leader said, the current separatist agitation is “a rejection of the Nigerian state by a group that feels already rejected by that state”. South-eastern governance failures also fuel unrest. Local political leaders have largely failed to harness the region’s resources, create sustainable employment and engage youth. As the president-general of the apex Igbo socio-cultural organisation, Ohanaeze, Nnia Nwodo said, Igbo youth “have passed a vote of no confidence in us their fathers”. The agitation therefore represents not only a protest against the state but a rift within Igbo society. Successive government responses have been generally intolerant and combative. The government generally lumps the separatist movement together with Boko Haram and the militant Yoruba group the O’odua People’s Congress (OPC) as “extremist groups” threatening national security. Under President Olusegun Obasanjo, the administration arrested the leader of the Movement for Actualization of the Sovereign State of Biafra (MASSOB), Ralph Uwazuruike, charged him with treason and detained him from 2005 to 2007. Police clashed with MASSOB members repeatedly, killing many. President Buhari’s government has been similarly intolerant. In November 2015, he issued a “serious warning” that: “The corporate existence of Nigeria as a single entity is not a subject of debate and will not be compromised”. On another occasion, he said: “For Nigeria to divide now…it is better for all of us to jump into the sea and get drowned”. Following from this hardline stance, security agencies shut down the unlicensed radio station, Radio Biafra, operated by the separatist group Indigenous People of Biafra (IPOB). They have banned pro-Biafran newspapers, arresting and brutalising non-compliant vendors. These measures have driven many publications off the streets, but have not curbed the even more vigorous social media. Security agencies have also broken up rallies and meetings, killing and arresting scores. An Amnesty International report alleged that security forces murdered at least 150 agitators between August 2015 and August 2016. The army rejected the report, but separatists say the number of deaths was even higher. In January 2017, when agitators organised a rally in “solidarity” with new US President Donald Trump, police reportedly killed 11 participants and arrested more than 65. Many are still in jail. The government also arrested IPOB leader Nnamdi Kanu in October 2015. He was arraigned and granted bail, but despite court orders for his release, he was held in prison until April 2017. Kanu’s prolonged detention turned him into a hero and increased IPOB membership. The agitation’s future trajectory is unclear. Much depends on the federal government. Further repression will earn the separatists more local sympathy and support and could push them to more desperate actions. If there is no progress towards constitutional, administrative and policy reforms that would respond to the demands of the south east, the agitation could escalate. Further demonstrations and government crackdowns could further strain the already over-stretched security forces, diverting resources needed to fight Boko Haram and insecurity elsewhere. Nobel laureate, Wole Soyinka, has counselled the government to ask the agitators: “What are those things we can do to make you content, to make you feel part of this entity [Nigeria]… What can we do to make them feel that they belong and are not alienated?” The federal government should heed that sage’s advice. In the short term, the government should refrain from further threats of “crushing” the agitation and free unconditionally the hundreds of protestors currently imprisoned. It should also reassure all regions it will allocate resources and develop infrastructure equitably. In the longer term, the National Assembly should resume its stalled constitution review and pass provisions that would guarantee all citizens a stronger sense of national belonging and redress the imbalance in administrative units between the zones. This is a key demand of south easterners and one already endorsed by the leaders of most other zones. The leaders of the south east must also respond to their region’s needs by focusing on economic development and curbing massive youth unemployment. The south east governors’ recent initiative towards integrated regional development is a welcome step that should be pursued vigorously. 50 years after the south east attempted to break away, the country remains fragile. Its democracy is still unstable, as demonstrated by the recent coup rumours as President Buhari is reportedly very ill.
At a 25 May colloquium on Biafra: 50 years after in Abuja, Acting President Yemi Osinbajo said the greatest responsibility of Nigerian leaders today is to give a pathway to unity in diversity. The country’s leaders must work harder to build bridges, close cleavages, and achieve a more cohesive country. If they fail, separatist agitations will grow even stronger. Nnamdi Obasi is Senior Advisor for Nigeria at International Crisis Group, the independent conflict prevention organisation. Igbos are not the truly marginalized people in Nigeria. The world should know that the reason for the Boko Haram insurgency rests squarely on a fact of marginalization. The Northeast is the poorest region in Nigeria and that is the highest level of marginalization. Boko Haram exploited that situation to start their violent uprising. Let us not distort the course of history. In a documentary titled: Boko Haram, aired on Aljazeera TV on Sunday May 28, 2017, it was clearly shown how one Yesuf single-handedly started the movement by condemning everything western. His inflammatory remarks in his mosque marked the beginning of the movement, which ravaged virtually the entire Northeast region. I, therefore, doubt how fair it is to compare the events in the Northeast with the deliberate marginalization of the Southeast. The peaceful and reasonable democratic answer to the BIAFRA agitation is referendum whereby the people will be freely allowed to express their mindset on Nigeria nation. This has been a big problem before the British Nigeria amalgamation of 1914 when British killed Bifrans and force them against their wish and 1949 when the Biafrans are massacred by the Nigerians that lingered down to Nigeria Biafra war of 1966 – 1970 with the genocide on the people of Biafra down to I999 till today that Biafrans are still killed in their numbers because of the want and restoration of the state of Biafra. Dear Bugi,Thanks for your comment,I believe in calling a speard a speard, the Boko Haram you are talking about does not equate their demands with what the Biafrains are complaining about, Boko Haram does want western education and all the rest.Please if you can go through,what the Biafains are complianing about and re-comment. Right now I am in my office , my boss is absent, same with his secretary(both Igbos). They make money under the Federal Republic of Nigeria but their actions point to one thing (Sabotage) ….. The Igbos are the architect of their problem and the writer should please shift post. Between 1999 and 2003 how many Senate Presidents did we have? They (Igbos) do know that it was a failed test , because it points to instability if they could not rally around one person as President of the Senate. Secondly in Democracy , an elected Governor or President will surely approve developmental projects where they have larger votes and supporters, yet PMB wanted to bring them into his fold( recall that he made attempt to visit Rivers State) but was told his security cannot be assured in a country that he is President………… We all waited to hear South-South / South East Governors to dissuade their people from threatening the Office or the President of the Federal Republic of Nigeria. Lastly…. I have listened to the way the Igbos are trying to link themselves with Jews, it is most unfortunate for them to allow such foolery in this era, Jews who rejected the Manna from heaven(imagine how much the would have been making from tourism based on the ‘Manna from Heaven’ , now they are busy causing unrest and defying the United Nations, Pushing the world into a chaos . It is good for the Igbos to link themselves with a nation that thrives on war because that is what the Biafra founding fathers were known for. My advise to the average Igbo man is that they should not allow themselves to be fooled a second time, it will be too costly for all Nigerians. Your essay was lopsided and reflects your ethnicity.The Igbos are not marginalised. They have been fully integrated into governance in Nigeria. The records are there and not hidden. As for the presidency, the Igbos are the enemies of themselves. Two much deceit, too many lies and too much in-fighting. Let the Igbos put their house in order. Biafra can never be achieved on a foundation of lies and half truth. This is 2017 and not 1967. Issues are easily verified. First prime minister Tafawa Belewa a northerner, Yakubu Gowon a northerner, Murtala Muhamed a northerner, Shehu shagari a northerner, muhamadu Buhari 1 as military head of state and now i civilian president a northerner, badamasi babangida a northerner, sani abacha a northerner, adulsalami abubakar a northerner, Umaru Musa Yaradua a northerner and now Buhari also a northerner, all are Hausa Fulanni, all are Muslims, all accept Yaradua and shagari are military men in a country that has a greater number of Christians than Muslims. On the other hand Igbos are marginalized and denied anything from Nigeria, made to hustle on their own and fend for themselves, made to pay before their roads can be rehabilitated and Nigerian government will place the custom services to search them from shagamu down to Onitsha brigde and seize the good they but from Lagos terming them illegal while people are allowed to sale and buy them freely inside Lagos, the north has everything that helps living which explains why Igbos are flocking there, truely truely i say unto Nigeria, Biafra will not miss you a single minute, Igbos outside of Nigeria are more in numbers now than those inside it and the number is still counting, what does Nigeria have for easterners? nothing other than riots and cheatings. @Stephen Bugi, Boko Haram have never in her various statement on the media claimed marginalization or Nigerian structural inbalance as reason or reasons for her violent and devilish uprising in the northeast of Nigeria. They are seriously advocating for the islamization of the country and the abolition of western education and civilization. They even demanded that the then President Goodluck Jonathan should convert to Islam as part of the condition for negotiation or truce with the government. Such an unholy organization and her misconceived intent can not be likened to the genuine quest by the southeast or former eastern Nigeria for a separate homeland or to restructure the Nigeria state which the Hausa – Fulani and their southwest cohort has vehemently opposed as the current arrangement favors their satanic design to keep the country perpetually under servitude. But time will tell by His grace. I WANT TO ASK THE WORLD & NIGERIA GOVERNMENT A QUESTION::::::::::::::::::Is love and marriage by force? You cannot hate someone and force them to remain with you. When marriage has gotten to the stage of “either you kill me or I will kill you”, is it not better for the both parties to sign divorce papers and go peacefully? The Igbos has ran out of patience for being marginalized and treated as foreigners in a country they are forced to live ever since the war ended in 1970 and those things that pushed us to war has multiplied. Let’s not forget that the Nigeria side made laws to impoverish the Igbos tribe of Biafra, they took all the Igbos properties as the so called “abandoned property acts” took all the Igbos money in the bank and gave only 20 pounds to any Igbo irrespective of thousands of pounds they had in account before the war, Nigeria promised and FAILED to rebuild the Biafra states that was destroyed by war while Igbos rebuilt it by themselves upon Igbos lost everything they had in the war. The West and North sold all the Nigeria properties/companies to themselves. …………..The WEST and NORTH’s wealth root was inherited wealth since 1914 of Nigeria Amalgamation and stolen Igbos money in the bank before the war plus the hijacking of the Nigeria oil money till date…….while the Igbos wealth till today started just from 1970 after the war ended, so if you are hating the Igbos at least give them credit for making it to the number one again after all the efforts to make them the poorest yet they rise from 1970 to today as the number one tribe in Nigeria with highest standard of living and that has attracted deep hatred and envy to them. Yet you still want them to remain in the same country called One-Nigeria? The Igbo are the only tribe in Nigeria that goes to every corner of Nigeria to develop it from bush to city that shows true commitment for One-Nigeria to work but all they got in return are hatred and killing them for being successful. They has been the strong pillars in development of Nigeria, the Igbos are the only tribe who has tried their best to make one Nigeria work but from every indication it shows that the WEST and NORTH does not mean One Nigeria from their heart, in their dictionary one Nigeria means “OIL” from the Eastern Nigeria as they (North and West) owns more than 80% of oil blocks while the Eastern Nigeria that are the original owners of the oil got very less, the oil money are being used for massive projects in the North and West with less or almost nothing to the Eastern Nigeria. When people (North & West) are on the benefiting side they always want to keep it that way……….I have a message from one of my favorite song of a legend – PETER TOSH: “Everyone is crying out for peace, nobody is crying out for justice, I don’t want NO peace, all I need is equal right and justice”. Therefore since Biafra has tried everything to get equal right and justice after 50 years of war and still Nigeria vowed never to give it to them, then it is time for Pharaoh to let my people go. If you have listened to what the Former President Olusegun Obasanjo said few days back about a married woman who always complained of ill treatment by the husband and want a divorce, you will understand more better what the Igbos are agitating for. “if you were not present when a corpse is buried, you will not know where the head lies”. Some people only talk just to exercise their ignorance in issues they don’t know its genesis simply because they don’t like the tribe. I think that stereotype against the Igbos is unjust. The Igbos calling for referendum is not a crime and I can’t see the reason why it should be a problem to Nigeria govt. What are they scared of? Other countries has conducted and still conducting referendum peacefully but here people perceives you as an enemy calling for war when you demand for it; that’s ignorant of facts. Please, REFERENDUM remains the best solution to Igbos agitation weather anybody likes it or not. After 50 years of the Civil war, which wasted the lives of about 3million Igbos mostly children, coupled with consistent Fulani Herdsmen attack and Islamic riots targeting Christians (mostly Igbos). This Demonic god called Nigeria constantly requiring the blood sacrifice of the Southerners mostly Igbos to appease must be stopped. Hence the South East mainly Igbos accepts self determination as path to freedom, peace and development. This union called Nigeria is unworkable, stop the killings of unarmed Biafra agitators now, and call for referendum. The action of your boss and the secretary not being at work today shows that the Nigeria they are forced to live has killed their spirit and that is to tell you the result you will get when Nigeria call for referendum. In your mind you think they are for Nigeria because they are working under Nigeria which is been paid from the money from Biafraland but just call referendum you will be surprised to get 85% YES to Biafra. It is like when you kidnapped a girl and force her to marry you and live with you in your house, her empty body can be in that house but her heart/spirit is not there. So you can call it sabotage all you want but the truth is that if Nigeria fail to address this issue to let equal right and justice lead Nigeria then it can never stand as a nation. For how long will you force a girl to stay with you in marriage that you are only the person benefiting while she is your slave and needed her freedom by all means? It is just a matter of time. The Yoruba will always cry and trying everything possible to discourage the Biafra from pulling out only because the WEST and North are the two sides benefiting from the fake one Nigeria which to them it means Oil. I would have loved to remain one of the strongest advocates of one united Nigeria because my grand father of blessed memory – Paramount Chief Njoku-Nwansi was one of the fore-most British warranted paramount traditional leaders who was chosen by the then British colonial Governor-General to lead some other selected traditional rulers of the south-east to Lokoja for the amalgamation of the north and south protectorates under the watch of lord Luggard in 1914. But the situation of life the entire Igbos innocent civilians have witnessed and still subjected to in Nigerian since after the January 1966 when some young army officers of the south-south, southeast and southwest origins staged a military coup which succeeded only in the then northern region and partially failed in the the South,and after the reprisal coup of 29th July 1966 and subsequent civil war that followed, has convinced me to believe that though Nigerians want the Igbos for what they can get from our resourceful life and natural resources but do not love the Igbos. The wicked economic blocked,sufferings, mass massacres and deaths of the Igbos masses who did not have anything to do with military affairs has since after the war made me to change my mind to support the separation of the Igbos in particular and the people of the former Eastern Region to go their own way.If the purpose of the war was not to vanquish us and delay our enterprising spirit/cause economic stagnation and finally grab our natural resources/crude oil deposits to share among other economic weak ethnic groups alongside their British supporters,why seize all the properties of the Igbos in other parts of the country? Why did the Nigeria’s federal government confiscate the money all the Igbos had in the banks after the war in 1970?? Nigeria should allow a referendum to determine the mindset of the Igbos in the Nigerian project….no force can stop or change the Igbos from this goal because no matter what it takes….my people should be let go. Once upon a time in Nigeria, Igbo people dominated the entire political landscape of Nigeria. They were in charge of the government, the army, the police and the entire civil service. This Igbo dominance of the Nigerian political landscape was courtesy of the British and not as a result of any special abilities as proclaimed by Chinua Achebe in his last authored book. Ironically, the British are today the Igbos eternal enemy. The Hausa-Fulanis were the preferred ethnic group to dominate Nigeria by the British but unfortunately they did not have the requisite education to run the institutions of the state hence the Igbos. The British would rather have the Igbos run the country than have the Yorubas run it. This is despite the fact that the Yorubas had 100 years of head-start in Western education over the Hausa-Fulanis and 50 years head-start over the Igbos (speaking of marginalization). The purpose of my preface above is to help readers of my essay understand the thesis of this essay. The thesis of this write-up is that, all the socio-political ills that afflicts all the non-Hausa-Fulani people in Nigeria today was caused by the Igbos. Can I support my assertion? Yes! The genesis of the inequalities that all the non-Hausa Fulani ethnic groups, including the Igbos, suffer in Nigeria today started on the night of January 15, 1966. On that night, the president of Nigeria, the president of the Nigerian Senate and the commander of the Nigerian army were all Igbos just to mention a few of the prominent positions held by the Igbos at the inception of Nigeria. The near total control of Nigeria was not enough for the Igbos, they had to take full control hence the decision by Emmanuel Ifeajuna & Co. to eliminate all obstacles to the Igbo man’s agenda of total control of Nigeria. Remember that the Igbos had near total control of Nigeria at Inception, their defeat means that control would shift, which was exactly what happened in July of 1966. The Igbos were totally trounced by the Hausa-Fulani with the active support of the British in July of 1966. The British told the Hausa-Fulanis to discard their “Operation Araba” agenda and capitalize on the opportunity that has presented itself to them as a result of their defeat of the Igbos. “Araba” in Hausa means secede, the initial plan of the Northerners was to breakaway from Nigeria after their defeat of the Igbos in July of 1966 but the British persuaded them against that decision. What the defeat of the Igbos in 1966 meant for all the non-Hausa-Fulani including the Igbos, is that we all now have a new internal colonial power, the Hausa-Fulani. The structure with which the Hausa-Fulani continue to use to oppress on the other ethnic nationalities in Nigeria today was created by Johnson Aguiyi-Ironsi, an Igbo man. The unitary system that is the root cause of all the socio-economic imbalance today was created by the Igbos hence my submission that the Igbos are responsible for all the problems we face in Nigeria today. I know that prominent Igbo commentators such as Chimanda Adichie and the Late Chinua Achebe like to attribute their so-called “marginalization” to the hatred of Igbos by other Nigerian ethnic nationalities. They always like to re-write history and refuse to acknowledge that the actions of Emmanuel Ifeajuna and his group and that the ambitions of Igbo leaders such as Nnamdi Azikwe, Michael Opara and others and the failed leadership of General Aguiyi-Ironsi precipitated the killings of the Igbos in the northern part of Nigeria. The Igbo, as usual does not take responsibility for their role in the woes of Nigeria continue to blame other ethnic nationalities in Nigeria, especially the Yorubas for their predicament in Nigeria today. The truth of the matter is that any objective observer of Nigeria will realize that Nigeria is a nation of two class of people, the political elites and their hangers-on on one side and the marginalized majority on the other side. Nigeria is really not a place where you gain advantage as a result of your ethnic affiliation, you gain advantage in Nigeria as a result of your political status and political connections. The average Northerner in Nigeria today suffers more socio-economic woes than the average Southerner. If ethnic affiliation translates to socio-economic advantage in Nigeria, why do we have the Almajiris in the North? Here’s what is positive in Nigeria today, democratic rule. What this means is that we now have a platform and the power of the ballot to force our internal colonizers, the Hausa-Fulanis to meet some of our demands, especially the re-structuring of Nigeria as pointed out by the writer of this articles. As far as the Igbo agitations in Nigeria today are concerned, the solution is to elect one of them as the next president of Nigeria. The Igbos without any known natural resources are not dumb to really want to secede from Nigeria, as a matter of fact, they and the Hausa-Fulanis are the major beneficiaries of the unitary system in place in Nigeria today, remember the Igbos created this unitary system; does anyone think they created this system for no reason. The Igbo have never forcefully demanded for the restructuring of Nigeria, they gripe is and has always been that they’re not being allowed to dominate the unitary system they created, I mean read the article and see the Igbo man’s definition of marginalization; lack of access to the presidency of Nigeria nothing more or less. Dele, so your own version of marginalization is lack of access to power. Every white man hates mediocrity. The British could not afford to hand over the running of vital ministries to the Housas and even to the yorubas because they don’t want the system to collapse. they discovered, upon arrival, the special abilities and ingenuity of the ibo people, coupled with their educational background. Based on these thesis, they felt compelled to place them at strategic positions to run the affairs. You digressed to education with a style that favours the yorubas against the ibos. you need to carry out your research properly. Go through thorough statistics dating from time immemorial till date, you will discover a bitter truth that the yorubas is not ahead of the ibos. Your silly and malicious assertion that the ibos wanted absolute control of power that is why they struck through a coup is really childish. i am forced to believe that you just listened to a particular moon-light story before writing this. if the coup of 1966 was any ibo agenda, tell me why four yoruba military officers like Maj. Adewale Ademoyega (Yoruba), author of “Why we struck”, Capt. G. Adeleke (Yoruba), Lt. Fola Oyewole (Yoruba), author of “The reluctant rebel”, Lt. O. Olafemiyan (Yoruba) are involved. also tell me why the likes of Lt. Tijani Katsina(Hausa/Fulani), Capt. Gibson Jalo (Bali), Lt. Dag Warribor (Ijaw), 2nd Lt. Saleh Dambo (Hausa), 2nd Lt. John Atom Kpera (Tiv) were actively involved in that bloddy coup. i know by now, you will start to consult your books to determine if those names were actually involved in that coup. thats exactly what you silly brain is trying to fathom right now. You can now see that I am really concerned that you are dishing out an essay of falshood without adequate knowledge of what you are saying. Its funny when any body says, its an igbo coup. The same problem and rot in the system that led to 1966 coup also made several other coups after that inevitable.